MarkD thank you for posting the pix! I've seen this happen to roads here. That spillway will be gone soon. Looks like a large chunk of something being borne on top of the water there, just to the right of the spillway. Any more pictures available so we can see if that moved? If that's part of the spillway structure, it's going fast. there's video about halfway down the twitter page showing the complete breach. unfortunately I don't know how to embed twitter videos here. I don't know if this will embed or not, so here's the embed code for the complete breach, it's a video. I read years ago that the MAINTENANCE of infrastructure cannot be done with the existing local, state and federal economics. Stated another way, the costs of BUILDING infrastructure (roads, sewers, utilities, etc., etc.) is NOT able to be afforded by the taxpayers on a pay as you go basis. These costs are BARELY able to be afforded when the taxpayer borrows and borrows and borrows (bond issuing, etc.) to get the infrastructure BUILT. So the taxpayer is well underwater getting them built. The claim is there is NO way to then MAINTAIN the stuff. Add to that the government bezzle, skimming, misappropriation, cheating and the rest and there's simply NO way to maintain the infrastructure. So the ONLY way to proceed is to fix stuff when it breaks. Reactive only; no preventive. There's no money for preventive (i.e. maintenance). The country has been conquered and is under occupation. That's a fact. Before you dispute it, gather your facts. Got any? Looks like it is still raining there . . . There is a north Texas lake that had something similar happen 30 years ago. It was the dam on the Grapevine lake near DFW and the water was going over the spillway. In a day the road was gone and the cut was working back toward the actual dam. It got to within about 100 yards of undercutting the concrete pad to the base of the dam before the water level went down enough. It sure screwed up my commute for the rest of the year! I'm not sure exactly where that dam is, but southern Oregon/northern California is getting heavy rain right now. Our little valley is already flooding (we are well above the flood plain, but I have friends who live down in the bottom land). The flooding is mostly because the heavy snows we've had are quickly melting off. Sure glad we don't have any dams upstream from us! ETA: I checked the maps and found where Oroville is. Yes, if I lived in Oroville, I would be packing up all my necessities and my valuables and getting out of there RIGHT NOW!! The 1 o'clock flow numbers are in... We are at 150kcfs into the lake, with 40kcfs out. Mark D, I have a friend on facebook who is saying the spillway is closed, is fine, no more water, and they are fixing it. Huh? Could this be true? Cascadians, do they have first-hand knowledge? I.e., do they live in Oroville? If not, probably better take their information with a grain of salt. I don't see how the damage already shown could possibly be fixed until the water levels go down a whole bunch. I just checked a few seconds ago to see if he had added any new information, and the videos from earlier today are still there. 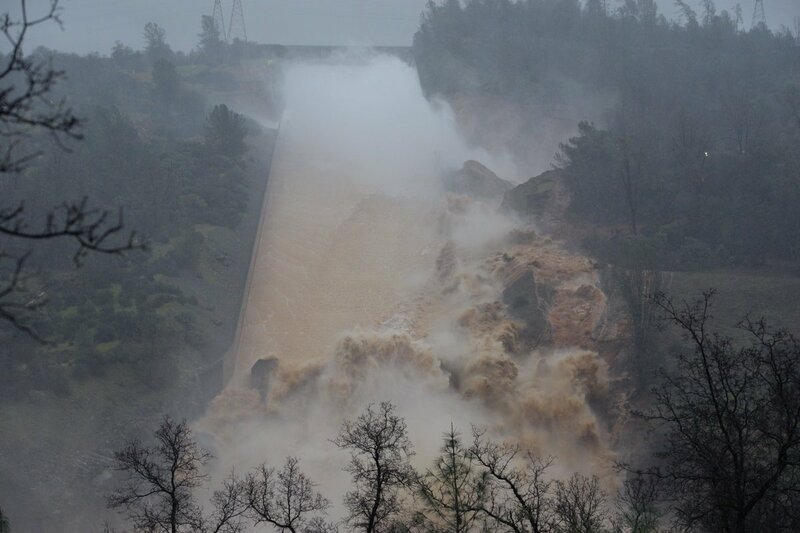 However, ummmm, the latest video shows massive water flow and damage down that spillway. She is cray cray. I'm pretty confident at least one poster here is already watching there, but there's a thread at ar15.com that is getting heavy input and some reasonable technical analysis. There's no way it's gonna get fixed until drought season. And by fixed, I mean completely replaced... The bottom 3rd of the spillway is GONE as you read this. Right now, the Inflow rates for the lake are FAR beyond the outflow capacity. They should have been running the spillway at 100% since yesterday, but they dilly-dallied, and now it's too late. The choice has been made for them. With the current numbers, the water will crest the emergency spillway tomorrow morning. There isn't any fixing going on right now. What concerns me is the possible backlash against innocent Muslims this could create. I'm so full of white privilege i didn't even think of that. I dunno... our local electrical cooperative is the best in the state (comparing "for profit" companies with them) for proactive maintenance. They get tree trimming companies out every summer, keep right-of-ways trimmed back, and respond to any calls about iffy situations within a few hours. Our electric rates are the lowest in the state, and our "time up" (without outages, specifically caused by equipment failures owned by the cooperative) is nearly 99.9%. Contrast that to NYSEG (NY State Electric and Gas), a for profit utility, which actually serves our nearest neighbor and then areas farther east from us (we thank God every single day that we're on the co-op). They pay FIFTY PERCENT more per kilowatt hour, and their up time is in the 96% range. If their power goes out, it can be 24 hours before someone finally gets around to fixing it. When ours goes out, unless it's a trunk line issue (out of the co-op's control) or is due to huge storm damage, we're usually back up within 2 hours, Max. We bought a generator in 1999. We've been glad to have it a couple times especially when we were milking cows, but we've NEVER had a time where we had to use it for two consecutive milkings. OTOH, the large farm in the valley, 1/2 mile away, has had to run multiple milkings on generator power at least a dozen times in the same time period. I don't believe maintenance can't be paid for... it just doesn't make sense under the current capitalist, "profit at any cost" model. (oh, and the co-op has been known to repair problems such as a loose ground ON OUR SIDE OF THE POLE, free of charge. When our house burned years ago, they came out and rewired the service to the barn- at 11 pm- so we could milk the cows that night. Free of charge. You are right, they will have to use the spillway, it and the immediate area will sustain further erosion damage which is unavoidable. Spillway has collapsed. Pix. Somebody please post, thanks! Also school cancelled for tomorrow due to dangerous lake levels. EVACUATE THE TOWN NOW; I moved to Colorado not too long after the Estes Park disaster which was a flash flood and had a friend that did her college final paper on the whole cluster f...k; in those days there was more excuse because there was now way to view things from outer space, not even a way to send in a plane during bad weather. I can only think it was divine intervention of some sort....but I think this time; the danger is obvious and right there, anyone who can needs to take the initiative and get out; and if they can't they need to get anything of value and their families out. If the rains continue (and it looks like may) this will likely repeat all over Northern California again in some of the poorest, most conservative (or Libertarian) rural areas that have been neglected for decades (basically State of Jefferson and nearby areas; also in the mountains). Also how much did California waste on a high speed train between Los Angeles & Las Vegas? From Congressman LaMalfa: Forwarding Assemblyman Gallagher's post on latest with Oroville Dam and its spillway. With 21 feet of space left right now and about 100,000 cubic feet per second coming in, it is a challenge the next 2 days. They seem to be able to push 12,000 cfs thru the powerhouse, and I think it was wise to experiment with the spillway at a lesser number than the 50,000 that had been running when it broke up. 20,000 cfs was tried for a few hours and is being assessed if the spillway can handle that for the time being. A total of 32,000 cfs will buy time until the storms subside and the inflow is less than 32,000 cfs. The "emergency" spillway isn't intended as a panic inciter, or the term "uncontrolled" isn't necessarily all bad. 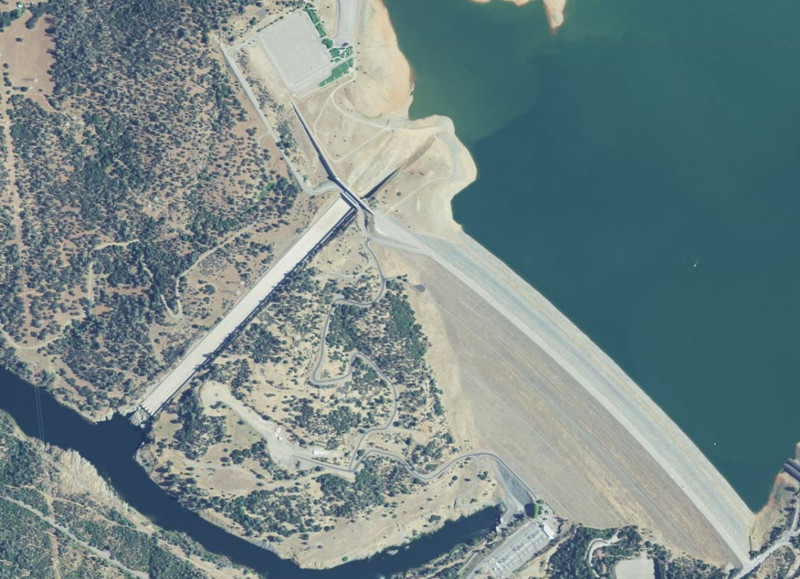 If the spillway is deemed as handling 20,000 cfs and the powerhouse keeps up 12,000, then when the lake hits 901 feet of elevation the rest of the lake inflow goes over the functional emergency spillway. We do need the storms to subside in 2 days or less so that the outflow doesn't overwhelm these 3 outlets. I'm not sure that 70,000 cfs of a 100,000 total lake inflow going over the emergency spillway is likely in the coming days, but the river itself can handle it. Is that a stream of water next to the hole. I can zoom in on my smartphone and it looks like a stream of water. There's water running down the spillway continuously. Looks like it's coming in from drain pipes sunk into the hill on each side, probably to keep them dewatered so they don't get unstable. When I first came to San Antonio we were able to drive across the dam to a small area, then it was restricted to walking..now you can't get near it. For a thrill follow the road to the house sitting at the foot of the dam and look up from the wooden bridge. What it was looking like a few hours ago. Looks like the lake level went up a full 12" in the last hour. At this rate, the emergency spillway might be in play before morning. If the pressure reveals unknown weaknesses in the dam itself, this could get interesting. That is nuts...When the failure was first discovered it should have been immediately filled with stone a covered with hydraulic cement as a stopgap. Difficult to understand why they wrote off the entire spillway with their intentional inaction. If this is the best action plan they can come up with, in a state with seismic activity, I'd be getting out of there for good. Part of the proble is many million of tax revnews are being stolen each year and bringing a stop to it will have to be done by force by the people. There is no way they can use the spillway. The water will erode the whole side where the spillway is. I fear this is certain - disaster. Plus alot more water is filling the reservour faster than what is being released. Reading some estimates that the dam will breach around midnight tonight. Water in lake rising rapidly. Tomorrow's forecast changed from showers to heavy rain.